Indians have taken to social media to demand revenge after the army accused Pakistani troops of killing two Indian security personnel in disputed Kashmir. The army accused Pakistan of mutilating the bodies in Monday's clash on the Line of Control - claims the Pakistani army denied. But Indians, including the mourning families of the soldiers, feel Pakistan "should be taught a lesson". Indian PM Narendra Modi has also been criticised for "not taking any action". Monika, the daughter of head constable Prem Sagar, said she wanted Indian forces to kill at least 10 Pakistani troops to avenge her father. Many on social media have shared similar sentiments using the hashtag badlalo (take revenge). Some anger has also been directed at Mr Modi, making #ModiWeakestPMever one of the top trending hashtags in India on Tuesday. Others have pointed out that Mr Modi was yet to appoint a full-time defence minister after Manohar Parrikar left the post to become the chief minister of the coastal state of Goa. India's finance minister Arun Jaitley, who is also in charge of the defence ministry, said the incident was "reprehensible and inhuman". "Such acts are unheard of even during wars and definitely never in peace time," he said in a statement broadcast on Indian television. "The entire country has full faith in the army that they will give the appropriate response." But Pakistan rejected the allegation, saying its army "was a highly professional force" and it would "never disrespect a soldier, even Indian". "Indian blame of mutilating Indian soldiers' bodies are also false," it said. Claimed by both countries, Kashmir has been a flashpoint for more than 60 years. India and Pakistan have disputed the territory for nearly 70 years - since independence from Britain. Both countries claim the whole territory but control only parts of it. Since 1989 there has been an armed revolt in the Muslim-majority region against rule by India, which is mostly Hindu. Two out of three wars fought between India and Pakistan centred on Kashmir. A new war could be even more disastrous as both states now have nuclear arsenals. Meanwhile, authorities in Indian-administered Kashmir have cancelled by-elections for a parliamentary seat following violence in the state. The situation has been tense in the region since security forces clashed with protesters during another by-election on 9 April. 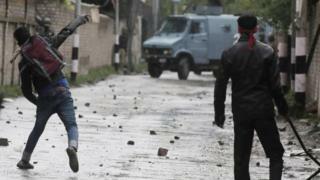 At least eight people died and scores suffered injuries in the clashes. Paramilitary forces fired bullets and shotgun pellets as people protesting against Indian rule stormed polling stations near the capital, Srinagar. Separatist leaders had called for a boycott of the vote.